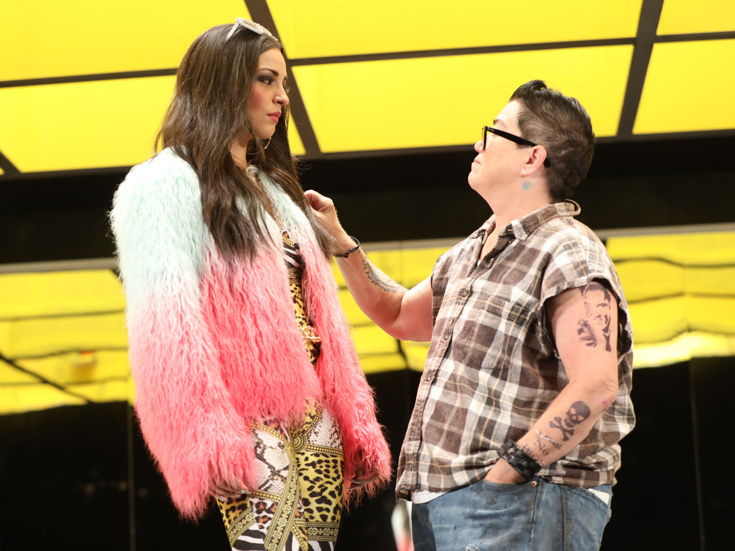 Ana Villafañe & Lea DeLaria in "Collective Rage: A Play in 5 Betties"
Now you have more chances to catch this starry New York premiere! Jen Silverman's Collective Rage: A Play in 5 Betties has been extended by off-Broadway's MCC Theater. Originally scheduled to run through September 23, the new production, directed by Mike Donahue, will now run through October 7 at the Lucille Lortel Theatre. Collective Rage: A Play in 5 Betties centers on five different women named Betty: one rich, one lonely, one charismatic, one lovelorn and one who keeps working on her truck. One of them has decided to stage a production of that play within a play. The cast includes Ana Villafañe (On Your Feet! ), Obie winner Lea DeLaria (Orange Is the New Black), two-time Emmy winner Dana Delaney (China Beach), Adina Verson (Indecent) and Chaunté Wayans (Fifty Shades of Black). The production features scenic design by Dane Laffrey, costume design by Dede Ayite, lighting design by Jen Schriever, sound design by Palmer Hefferan and projection design by Caite Hevner.